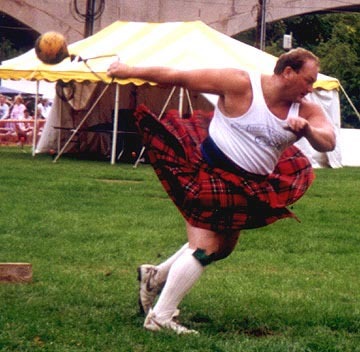 Open/Braemar Stones: The Open/Braemar Stones are the ancient ancestors of the modern-day shotput. In the Heavy Events the Open Stone weighs 16lbs. (the same as a shotput)and is thrown with an approach much resembling modern shotput techniques, the box for the Open stone is 7' 6" long and 4ft. wide. The Braemar Stone is a heavier stone generally weighing between 19-28lbs. and is the most ancient form of this event. The same rules apply in the Braemar Stone as in the Open Stone except there is no approach allowed. The stone must be put from a standing position. Reversing the feet after the release is allowed. Weights For Distance: Two weights are generally thrown, the 56lb. weight and the 28lb. weight. The overall length of these weights cannot exceed 18 inches and the athlete throws them from within a box that is 9ft. long and 4ft. wide. The weights are also thrown from behind a trig or toe-board that the athlete cannot step on or over. 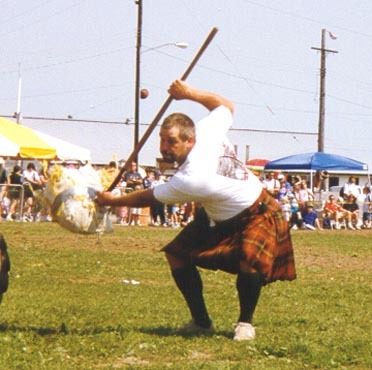 Scottish Hammers: Two Hammers are traditionally thrown in the Heavy Events, at 16lb. hammer (same as the modern Olympic hammer in weight) and a 22lb. hammer. These events are the ancient ancestors of the modern Olympic hammer throw. Unlike the modern form of the Olympic hammer, the Scottish Hammers have a rattan handle (closer to the original Blacksmith's hammer that was thrown) and are thrown from a stationary position behind a trig that cannot be stepped on or over as in the previous two events. Athletes generally attach a 3 to 6 inch spike on the sole of a pair of boots for this event so that they can dig their feet into the ground to provide greater stability and exert more force on the hammer. 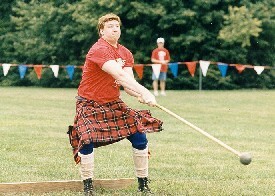 Caber Toss: The Caber Toss is the signature event of the Highland Games. A Caber (gaelic for "Tree") is exactly that, the trunk of a tree which is generally 18 to 21 ft. in length and anywhere from 90 to 150 lbs. 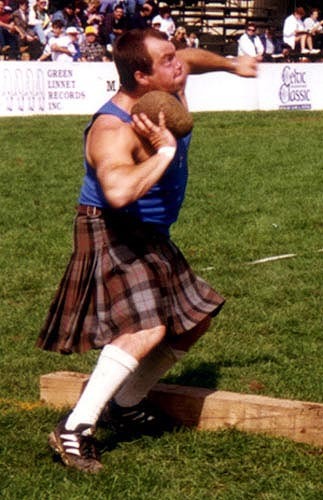 The objective of this event is for the athlete to flip a 12 o'clock, meaning that the athlete will "pick" the caber (the act of leaning down and popping the caber up into their hands), run with the caber and then attempt to flip it so that it lands perfectly straight infront of them or pointing to 12 o'clock on an imaginary clock face on the ground. 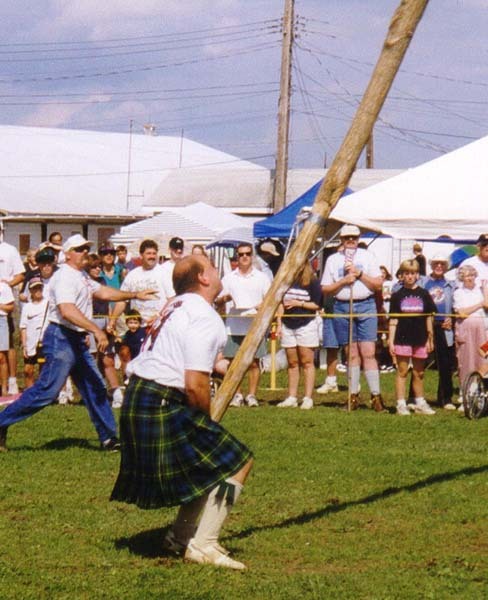 Points are awarded from 9 o'clock to 3 o'clock, and even if the athlete does not flip the caber they are awarded points for how far it goes over before it falls back in degrees. Sheaf Toss: A modern, American addition to the Traditional Events the Sheaf Toss is only contested in the Eastern, Southern, and Mid-Western parts of the country. An event usually reserved for Farm Festivals in Scotland, the Sheaf Toss has found a home among the Traditional Heavy Events and like the Caber is an event unique to the Heavy Events. 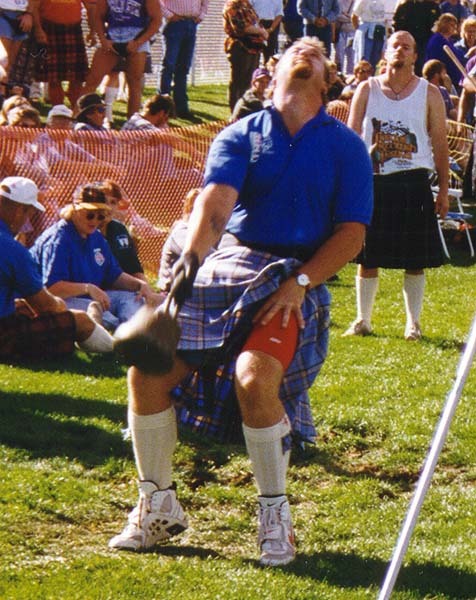 In the Sheaf Toss the athlete uses a 2 or 3 tined pitch fork to throw a 16 or 20 lb. bag over a bar. The athlete gets three chances at each height and is eliminated after missing all three chances at any given height. Weight For Height: The Weight for Height, or Weight Over Bar as it is sometimes referred to is contested with either a 56, 42, or 28lb. weight depending on the age and gender of the competitor. In this event the objective is to get the weight over a bar for height. Like the Sheaf each competitor is give three chances at each height until he or she misses three consecutive times and then they are eliminated.